Added by Indo American News on October 2, 2014. 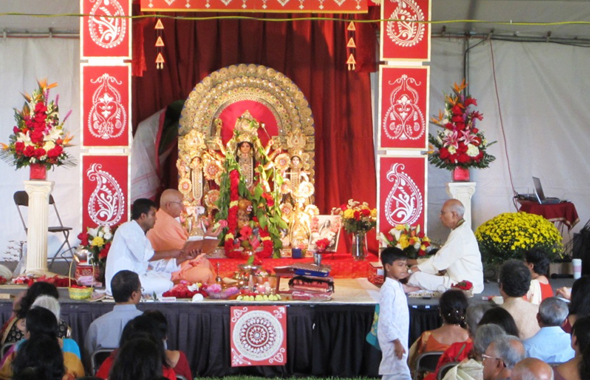 HOUSTON: The overcast sky on the morning of September 27 had an ominous tone signaling that rain might put a damper on the Durga Puja celebrations at the VSGH (Vedanta Society of Greater Houston) center. But far from it, Mother Durga showered her blessings on the devotees with a slight sprinkling of rain, washing away all the forebodings and turning it into a sparkling cool day, and a large number of devotees came in to see her resplendent form and enjoy her worship. The morning began with the sthapana of the idol of the goddess in the Puja Mandap to the blowing of the shankh and the beatings of the drum. After the idol was decorated with garlands of flowers & bilva patra, finishing touches were put by installing the sari clad kola bou, Lord Ganesha’s consort, next to him. The puja started with great piety and devotion by Swami Kripamayanandaji from the Toronto center. All five days of the Durga Puja, from shashthi to dashami were condensed into the half day Puja. Devotees got to chant and sing along the devotional songs presented by the VSGH choir in accompaniment with the puja. Chandipath was also done simultaneously with immense dedication. An added treat was the bhajans rendered by Pandit Suman Ghosh and his beautiful daughters. The beautiful Arati done to the ringing of the kaansar ghanta, the rhythm of the dhaak and the singing of Ayi Giri Nandini , with the chandelier pradip, flowers, and chaamara, tug at the heartstrings of every person present evoking a strong connection with the Divine Mother. The culmination of the puja with the pushpanjali when all got to chant the Durga mantras with flowers in their hands and then offering of the same gave everyone the ultimate sense of fulfillment. Lunch prasad and fruit prasad were then distributed in the food tent and devotees got to partake a healthy nutritious meal. Many devotees then went on to the main shrine to pay their respects to the Holy Trio of Sri Ramakrishna, Holy Mother Sarada Devi and Swami Vivekananda. The turnout of almost 400 devotees made the Durga Puja celebration at VSGH very successful. Announcements were made about the upcoming Youth Convention to be held on Jan 24, 2015 to celebrate Swami Vivekananda’s birthday. A multimedia presentation contest for 3 different age groups will be judged on the final day by none other than Swami Sarvapriyanandaji from Belur Math among other celebrated panelists. All interested participants were and are encouraged to register and submit their presentations. The following day, Sunday, September 28, Swami Kripamayanandaji gave a lecture on “How to worship God” where he described the various methods of worship including ritualistic, mental and spiritual and indicated that the best practice of worship is to keep God in mind in everything that we do.